Comments: Union Baptist Church is the oldest black congregation in the Scottsville area and was organized in 1865 by the Reverends Henry Smith and J. A. Doll. According to Virginia Moore in her book, Scottsville on the James, the first pastor was Rev. Smith, and the congregation held prayer meetings in homes until they bought two acres on Hardware Street. There they met for sermons, meeting first under an oak tree until their first church, shown at right, was built. This wooden structure stood next to the Union Baptist cemetery on Hardware Street until it was torn down after the new church sanctuary (top photo) was built. 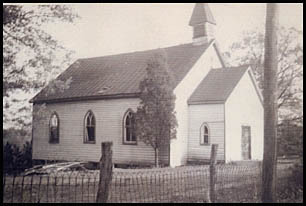 In the early 1950's, the congregation of Union Baptist realized that a new church building was needed to replace the old decaying, wooden structure. Reverend Houston Perry, their pastor (shown at left), designed a new church building to be constructed with cinderblocks as the memories of a forest fire that totally destroyed an all-wood church (Ebenezer Church near Fife, Virginia) where he'd pastored earlier were still fresh in his mind. Rev. Perry and John Dickerson of nearby Columbia, VA, constructed the new church from cinderblocks; the building was completed in 1954. 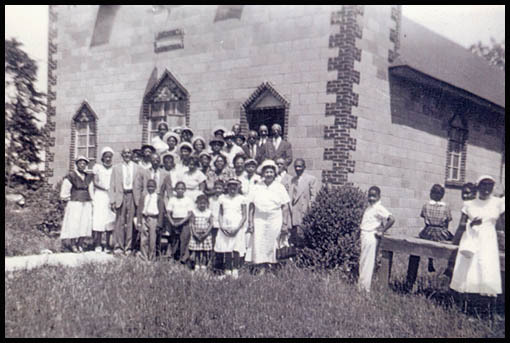 In the photo below, the congregation poses in front of the Union Baptist church after the first services were held in the new sanctuary. Rev. Perry is on the front row (fourth from left standing behind a young boy). 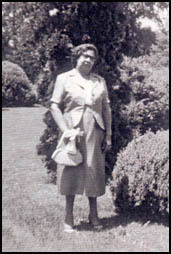 Union Baptist's first lady, Mrs. Ruth Perry is standing near the door and wearing a hat with white flowers. Union Baptist Church, like any other church, is much more than just a building. The Church - this body of baptized believers - assumes life within the minds and lives of its congregation. A feeling of oneness - of belonging - of family - germinates and grows within the members. The attitudes and attributes of the Church are greatly influenced by the Pastor. This can be seen in the recollections of some of those who worshipped at Union Baptist during Rev. Perry's pastorate. Mrs. Ella Anderson Mack, the oldest member of Union Baptist, warmly talks about Union Baptist and its influence upon her life. She reminisces: "I cooked for my whole life. I inherited it from my grandmother. I cooked at Scotts all my life. I had one Sunday off a month -- and went to church in Scottsville at Union Baptist, that I still go to now. Reverend Perry was the pastor there, and he built the new church. My husband is buried there. Somebody took me there last August -- the only thing I could do was just to break down and cry. I was so glad to be there. I went to see the cemetery there, that has been added to, I went there first. This man and his wife took me there, and I hope they are coming for my birthday (her 99th, celebrated December 15, 2004). They were so nice to me, I just wish I could pay them back in some small way." "When Daddy took her to the University, the doctor said no wonder you are getting sick, you not only have tumors, but you are carrying a baby. Mother said, 'Oh, that's impossible -- not at my age and my husband's age!' And the doctor said, 'Oh, yes, it is possible.' Houston is seven years younger than me. And my parents were married for thirteen years when I came along. My mother and father were 40 and 50 when my brother was born. My mother was tall and a stately, stout woman. She tailored all of her clothes, and so no one ever knew she was pregnant. Mom went the whole nine months and the only somebody that knew she was pregnant was Rev. Wicks, who used to come to church sometimes. And he said, 'I know you are making feet for shoes.' And Mother said, 'You think you know everything.' He said, 'I won't tell.' My brother was born just before Labor Day. we went to church every Sunday, and Daddy had said to me, 'Now if anybody asks how your mother is, you just tell'em she is not feeling well. So I would come to church with Daddy by myself and sit up on the front seat. 'Precious, how's your mother?' 'She's not feeling well.' 'She wasn't feeling well last Sunday.' I would sit there not saying a word. My Dad was sort of a serious type person, although if you got him tickled, he would bend down crying with laughter. On that Sunday, Dad said, 'Before I take my text this morning, I would like to announce to you that Houston Jr. and Mrs. Perry are doing fine. Now my text is...' And that broke up church -- WHAT did he say???? And they didn't hear a word he said the rest of the morning. And I laughed!" Among the special ties that Ruth remembers at Union Baptist were ties with Joy Renee Russell, who was her closest girlfriend and granddaughter of Arthur and Ernestine Burrell of Scottsville. 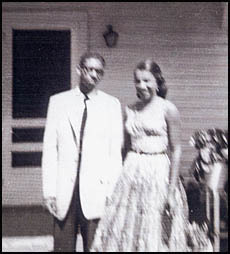 Shown at left is a 1950's photo of Renee Russell with her brother, Lawrence. "We only saw one another twice a month. So we would talk. Sometimes he (Rev. Perry) would move me from Renee Russell because we would be too chatty. Union Baptist was very close to us, because they were a different kind of congregation ... they were a very loving church and they really loved us. Every Christmas all families brought Presents. The other churches gave a purse, and Daddy would get $20 or something like that. But not at Union Baptist. All families brought presents and there was a present for my brother and a present for me. And that was always so special." Ruth remembers Sundays in Scottsville with Union Baptist families as a very special time. "When we would come up on Sunday morning, someone would invite us for dinner on the 4th Sunday. We would stay at that house until time for evening service. But I always wanted to go to Mrs. Burrell's to be with Renee, but sometimes I would have to be separated from her. When we got older, people would say, 'OK, we know Precious wants to go to Renee's.' One time Daddy said, 'OK, you be here at 6:00 p.m.' I think that Daddy always had his watch set ten minutes ahead because he despised being late. He never was late for anything. But I said, 'I'm always late.' I must say that my father rushed me all of my life, and when it comes to that, my brother is just like my Dad. So we left Mrs. Burrell's in plenty of time, Renee, Lawrence, and I, to get over to Ms. Wood's, but Daddy had gone. He had gone to Ms. Burrell's and saw there was no car there, so he turned around and went home (to Fife in Goochland Co.). We came back on the back road so maybe we would run into him. When we got back, Mrs. Burrell said that Daddy drove down into this driveway, and then turned around on a quarter. We waited, and we waited, and we waited. And after a while, I became very worried because in those times, the speed limit was 35 miles per hour. It would take an hour to get home, if not longer. And an hour went by, and I was still sitting at Mrs. Burrell's. So about two hours later, here comes Daddy, and I'm scared to death--too scared to even get into the car. He said, 'You get in this car. I told you to be there on time!' I said, "Daddy, we were there on time.' He and my mother had this argument because Daddy was going by his watch, and she said, 'You always set your watch ten minutes fast.' He said, 'Lawrence said he was going to have her here, and he will have her here.' So then, my mother lit into him, and when they got home, Houston started to cry and said, 'I want my sister!' So they drove all the way to Fife, and he turned around and came back to get me. I didn't know how I was going to stay in that car without Mom. 'You get in this car! You're never going to Mrs. Burrell's again -- when we're invited for dinner, you are going to come with us.' That held for quite a while. I was probably 14 or 15 at the time because I was 16 when I left here for Pennsylvania." Ruth also recalls some of the club and fund raising activities at Union Baptist. "I remember the Busy Bee Club at church and always thought that was such an interesting name. And that group of ladies were busy bees! Julia Lucas was the president, and Mary Jackson was a later president. As I said to Mark (Ruth's son), Union Baptist was build on food sales. These ladies baked every weekend. They sold baked goods every Saturday downtown. And what was left over on Sunday was brought to church and sold at church on Sunday. Miss Mary Jackson would make you buy something. They used to have Busy Bee or Missionary meetings, and we would come up for them. There was no such thing as babysitting in those days. We would go to the houses, and the children would sit in the kitchen while the meetings were going on. I always remember we would go to Miss Sadie Randolph's house when club meetings were there, and Gerald, her oldest son, would babysit for us. We always like it because to make the kids behave, he would give the kids refreshments intended for the club meetings before the adults had them. Gerald wanted to eat them himself. They would have little sandwiches and cookies, cake and punch, stuff like that. I always enjoyed that because I never went to any of the other meetings. They used to have meetings in the homes, and if my mother had to go, then Daddy would take her and come back home with us. That was a little different when you traveled that distance. The Christmas celebration was always very special to us, and we couldn't wait to get back home and open our gifts. That was very, very nice and wonderful." "The mission groups did regular missionary work. Union Baptist belonged to two Baptist associations, within the Baptist organization: the Piedmont Baptist Association and the Slate River Baptist Association. There was always a mission in the field that you supported on the association level. So they would raise money to support the Association. They also took care of missions in town, when someone was sick or in need, they would provide help where they needed to do so. They also contributed financially to the church. The Busy Bee Club, their main focus was raising money for the church." The ca. 1950-52 photos of the original Union Baptist Church; Rev. Houston Perry, Sr.; 1st Service at the current Union Baptist sanctuary, Lawrence E.Russell and Joy Renee Russell; and Ernestine Burrell are part of the Ruth Perry Hodge Collection at Scottsville Museum. Ruth is the daughter of Reverend and Mrs. Houston Perry, Sr., and resides in Carlisle, PA. 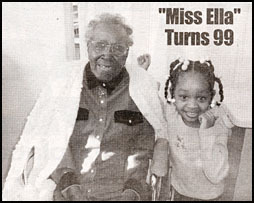 The 15 December 2004 photo of Ella Anderson Mack was provided courtesy of the Scottsville Monthly, Scottsville, VA; Photographer: Sally Browning. 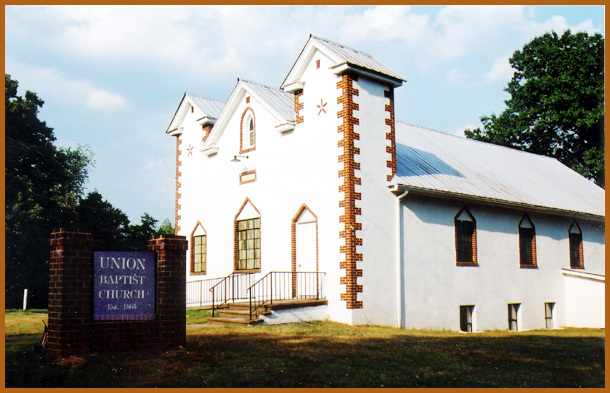 The 2001 photo of Union Baptist Church is courtesy Connie Geary, photographer, Scottsville Museum. 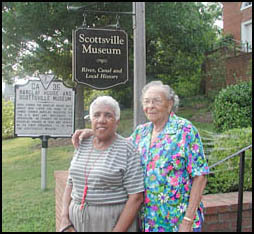 The 2004 photo of Ruth Perry Hodge and Dorothy Woody is courtesy Emily Kane, photographer, Scottsville Museum.